WordPress security firm Wordfence has warned that the number of brute force attacks aimed at WordPress websites has increased significantly in December compared to the previous period. While malicious actors often exploit vulnerabilities to hack WordPress websites, brute force attacks, where attackers attempt to guess a site’s username and password, can be highly efficient as well. 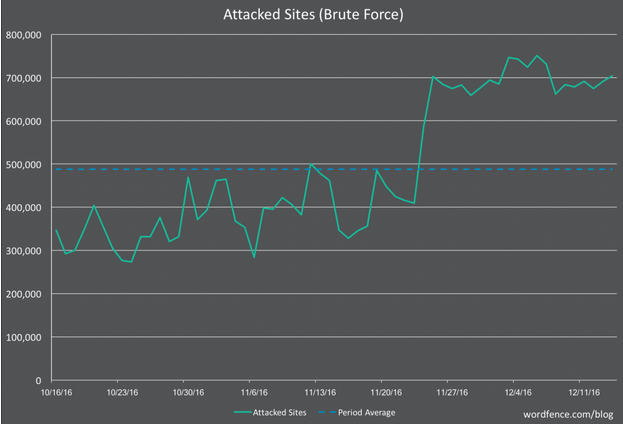 Wordfence has been monitoring brute force attacks and noticed a significant increase in the past three weeks. In the period between October 16 and November 24, the number of websites attacked each day was under half a million. However, the number of daily attacks soared starting with November 24, on some days exceeding 700,000 attacks. The security firm said it had blocked as many as 23 million brute force attack attempts per day. Both the number of attacks and the number of targeted websites have nearly doubled compared to the previous weeks. Experts also pointed out that the number of unique attack IPs also increased from an average of roughly 13,000 per day to more than 30,000. The attacks have been traced to tens of countries, but Ukraine accounts for the largest percentage of attacks (15.7%), followed by France (11.1%), Russia (6.8%), the U.S. (6.6%), India (5.8%), China (4.2%), Germany (3.2%), Italy (2.4%) and the U.K. (2.2%). The attacks coming from Ukraine originate from 8 IP addresses associated with a local hosting company named Pp Sks-lugan. The attacks coming from France have been attributed to 8 IPs belonging to a company called Iliad-Entreprises. The other top organizations whose services have been abused include France-based OVH, US-based GoDaddy and India-based BSNL. When it comes to WordPress attacks involving the exploitation of vulnerabilities, malicious actors usually target unpatched plugins. A study conducted recently by RIPS Technologies has showed that of 44,000 plugins available in the official WordPress plugins directory, 8,800 are affected by at least one vulnerability.